City of a 100 Museums"
Brussels (French: Bruxelles, pronounced [bʁysɛl], and sometimes [bʁyksɛl] by non-Belgian speakers of French; Dutch: Brussel, pronounced [brʏsəl]; German: Brüssel) is the capital of Belgium, the French Community of Belgium, the Flemish Community and the main seat of the European Union's institutions (and thus often considered 'The Capital of Europe'). 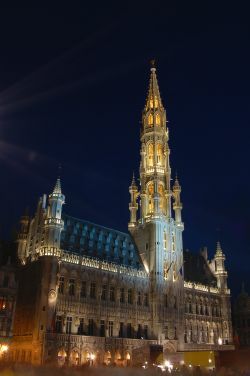 Brussels is, first of all, a city located in the centre of Belgium and is its capital, but it sometimes also refers to the largest municipality of the Brussels-Capital Region. This municipality inside Brussels is correctly named The City of Brussels (French: Bruxelles-Ville or Ville de Bruxelles, Dutch: Stad Brussel), which is one of 19 municipalities that make up the Brussels-Capital Region (see also: Municipalities of the Brussels-Capital Region). The municipality has a population of about 140,000 while the Brussels-Capital Region has 1,018,804 inhabitants ( 1 January 2006). The Metropolitan area has about 2,090,000 inhabitants. The Brussels-Capital Region is one of the three federated regions of Belgium, alongside Wallonia and the Flemish Region. 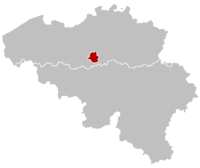 Geographically and linguistically, it is a (bilingual) enclave in the (unilingual) Flemish Region. Regions are one component of Belgium's complex institutions, the three communities being the other component: the Brussels inhabitants must deal with either the French (speaking) community or the Flemish Community for matters such as culture and education. Brussels is also the capital of both the French Community of Belgium (Communauté française Wallonie-Bruxelles in French) and of Flanders (Vlaanderen); all Flemish capital institutions are established here: Flemish Parliament, Flemish government and its administration (though Antwerp is considered the cultural capital of Flanders). Two of the main institutions of the European Union - the European Commission and the Council of the European Union - have their headquarters in Brussels: the Commission in the Berlaymont building and the Council in the Justus Lipsius building facing it. The third institution, the European Parliament, also has a parliamentary chamber in Brussels in which its committee meet and some of its plenary sessions are held (the other plenary sessions are held in Strasbourg, and its administrative headquarters are in Luxembourg). Due to this, some countries have three ambassadors present in Brussels: the normal bi-lateral ambassador, the EU-ambassador, and finally the NATO-ambassador. The "language border" divides Belgium into a northern, Dutch-speaking region, and a southern, French-speaking region. Although the real language border and the official one are largely identical, there are bilingual pockets on both sides with, in certain cases, no specific linguistic rights for the population speaking the other language. The Brussels-Capital Region is officially bilingual, while the majority of its residents speak French (see the linguistic history of Brussels in this article: linguistic situation section). The highest building in Brussels is the South Tower (150 m); the most famous probably the Atomium, which is a remnant from the 1958 World Exposition. The name Brussels comes from the old Dutch Bruocsella, Brucsella or Broekzele, which means "marsh (bruoc, bruc or broek) home (sella or zele)" or "home consisting of one room, in the marsh". "Broekzele" was spelt "Bruxelles" in French. In Belgian French pronunciation as well as in Dutch, the "k" eventually disappeared and "z" became "s", as reflected in the current Dutch spelling ((French) /bʀy.ˌsel/ ; Dutch /ˈbry.s(ɘ)l/ or /ˈbrɘ.s(ɘ)l/). The names of all other municipalities in the Brussels-Capital Region are also of Dutch origin, except for Evere, which is of Celtic origin. In 977 AD, the German emperor Otto II gave the duchy of Lower Lotharingia on the empire's western frontier to Charles, the banished son of King Louis IV of France. Mention was already made of Brussels at the time: Bishop Saint-Gery of Cambrai-Arras settled a chapel on a small island (695). A century later Saint Vindicianus, also a monk of Cambrai-Arras, lived on that island. However, the founding of Brussels is usually said to be when a small castle was built by Charles around 979 on Saint-Géry island in the Zenne or Senne river. The donation by Emperor Otto II the Great is recorded. Duke Charles had a shrine built for the relics of Saint Gudula in the Saint Gery chapel. In 1041 the county of Brussels was taken over by Lambert I of Leuven, one of the Counts of Leuven who ruled the surrounding county, later the Duchy of Brabant. Under Lambert II of Leuven, a new castrum and the first city walls were built. In the 12th century the small town became an important stop on the trade route from Brugge and Ghent to Cologne. The village benefited from this favourable position and, as it grew to a population of around 30,000, the surrounding marshes were drained to allow for further expansion. The Counts of Leuven became Dukes of Brabant at about this time (1183/1184). From 1357 to 1379, a new city wall was constructed as the former one was already proving to be too small: the inner ring or 'pentagon' now follows its course. In the 15th century, by means of the wedding of heiress Margaret III of Flanders with Philip the Bold, Duke of Burgundy, a new Duke of Brabant emerged from the House of Valois (namely Antoine, their son), with another line of descent from the Habsburgs (Maximilian of Austria, later Maximilian I, Holy Roman Emperor, married Mary of Burgundy, who was born in Brussels). Brabant had lost its independence, but Brussels became the Princely Capital of the prosperous Low Countries, and flourished. Charles V, heir of the Low Countries since 1506, though (as he was only 6 years old) governed by his aunt Margaret of Austria until 1515, was declared King of the unified Spain, in 1516, in the Cathedral of Saint Gudule in Brussels. Upon the death of his grandfather, Maximilian I, Holy Roman Emperor, in 1519, Charles became also the new archduke of the Austrian Empire and thus the Holy Roman Emperor of the Empire " in which the sun does not set". It was in the Palace complex at the Brussels' Coudenberg, that Charles V abdicated in 1555. This impressive palace, famous all over Europe, had expanded a lot since it was first the seat of the dukes of Brabant, but was sadly destroyed in 1731 in a huge fire (all that now remains is an archaeological site). In 1695 Brussels was attacked by general Villeroy of King Louis XIV of France. A bombardment destroyed the city's heart: more than 4,000 houses were set on fire, including the medieval buildings on the Grote Markt or Grand Place. In 1830, the Belgian revolution took place in Brussels after a performance of Auber's opera La Muette de Portici at De Munt or La Monnaie theatre. On July 21, 1831, Leopold I, the first King of the Belgians, ascended the throne, undertaking the destruction of the city walls and the construction of many buildings. Under Léopold II, the city underwent many more changes: the Zenne was culverted (as it brought diseases), the North-South Junction was built, and the Tervuren Avenue was laid out. From May 10, 1940, Brussels was bombed by the German army however most of the damage was done in 1944-1945. The Heysel Stadium disaster took place in Brussels on May 29, 1985. The Brussels Capital Region was founded on June 18, 1989. Brussels is famous for celebrating its history, as well as history in general. This is most evident in the fact that Brussels has well over 100 museums. Although some misbelieve that the capital of Belgium is Brussels at large, according to the Belgian Constitution (Art. 194) the capital of Belgium is the City of Brussels municipality. Arguments that the use of lower case in "ville" and "stad" in Article 194 for "ville de Bruxelles" (French), "stad Brussel" (Dutch) makes a subtle difference and means that Brussels at large is the capital cannot be defended on a legal basis. 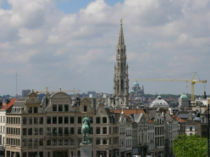 However, although the City of Brussels is the official capital, the by the federation and region delegated funds for the representative role of the capital are divided among the 19 municipalities and in practice, national Belgian institutions are indeed not only located in the City of Brussels, although many are, but also in most of the other 18 municipalities of the Brussels-Capital region. Meaning that de facto the entire Region serves as capital, but de jure only the City of Brussels is entitled to the title of capital city of Belgium. Grand-Place (Dutch: Grote Markt), the central market square and the jewel in Brussels' crown. The Grand-Place is Brussels' top tourist attraction justified by the Gothic magnificence of the Hôtel de Ville (Town Hall) and the Baroque exuberance of the late seventeenth-century guildhouses surrounding the square. The Royal Palace of Laeken and the Royal Palace of Brussels. Royal Museums of Fine Arts of Belgium (French: Musées Royaux des Beaux Arts, Dutch: Koninklijke Musea voor Schone Kunsten) combining four interconnected sections of old masters and modern art collections. Together they make up Belgium's most complete collection of fine art with works by, amongst many, Pieter Bruegel, Rubens, Delvaux and Magritte. Brussels is famous for being home to many Belgian comics characters, including The Smurfs, Largo Winch, Tintin and Lucky Luke to name but a few. Throughout Brussels, (also nicknamed Comic City) there are many murals and frescos celebrating the city's many cartoon heroes. On the site of the Heysel/Heizel are the atomium, one of the symbols of Belgium, a remnant of the 1958 World exposition in Brussels, and Mini-Europe, a park which hosts miniature models of famous European buildings. 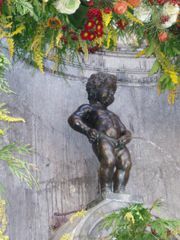 Manneken Pis (and Jeanneke Pis): a small bronze fountain sculpture depicting a little boy urinating into the fountain's basin. 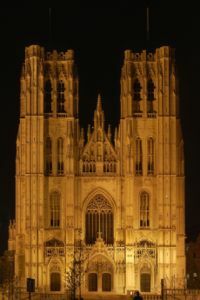 Several churches, such as the Basilica of the Sacred Heart in Koekelberg, and the Saint Michael and Saint Gudula Cathedral. La Bourse/De Beurs, the location of the stock market Euronext in Belgium. De Munt/La Monnaie, an opera house. Tour and Taxis: a former stockhouse of the Thurn and Taxis family. Avenue Louise/Louisalaan, an avenue in the fashionable part of Brussels. A good introduction to the brusseleir local dialect and way of life can be obtained at the House of Toone. This theatre of marionettes, originally located in the Marolles area, is now delivering its slapstick comedy in a 1696 estaminet a stone throw away from the Grand Place. The Ommegang (from old Dutch: walking around) started in the 14th-century as a religious procession. Taking place every year in July, it now commemorates Charles V’s Joyous Entry in the city in 1549. The colourful parade includes floats, traditional giant puppets, such as Saint Michael and Saint Gudula, and scores of folkloric groups, either on foot or on horseback, dressed in medieval garb. The parade ends in a pageant on the Grand Place. The Meyboom (tree of May) is an even older Brussels tradition ( 1308), which takes place paradoxically on August 9. After parading a young beech in the city, it is planted in a joyful spirit involving lots of music, brusseleir songs, and giant puppets. 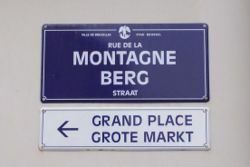 Brussels Capital Region is officially bilingual French-Dutch, although French, mother tongue of the majority of the population, is the lingua franca and is most widely used. Every public institution in Brussels, however, has to be bilingual. For most centuries of its history, Dutch, (Brabantian variant), or more precisely the linguistic predecessor of it, was the common vernacular. French was only used by upper classes (less than 5% of the population). Research in the city's archives indicates that Dutch was by far the most widely used of the two as a vernacular and in its local administration, until the French occupation in 1793, even though French had been the language of the governors since the Burgundian era (probably some governors also spoke Dutch). During the 19th and the 20th century, Belgium was completely dominated by the French-speaking bourgeoisie. Although the majority (about 60%) of the Belgian population spoke Dutch, it was French that became the official language. Civil administration, justice, education and even socio-economic business were for a long time conducted in French, even in the Dutch-speaking areas of the country. Brussels, naturally, attracted far more French-speaking immigrants than any other part of the country since it was there that the apparatus of the central government of the French-only speaking state was installed. In the capital Brussels, it was even more obvious that French rather than Dutch was the language of chances and prestige and more useful, as higher education and the better jobs all required French. Moreover, the Belgian state (founded in 1830) recognised Dutch, the language of the majority of its population, as an official language only in 1878. According to a 2001 study by Rudi Janssens, a sociolinguist at the VUB, 80% of the population are more or less native French-speakers, 8.5% are native Dutch-speakers and 10.2% have both Dutch and French as a mother tongue (often mixed-language parents). Allophones, who speak neither Dutch nor French at home, are a small but growing segment of the population. One third of Brussels' inhabitants has a foreign origin and does not have Belgian nationality. Since Brussels is completely surrounded by Flemish territory, the number of Dutch speakers is quite large during working hours and in cultural consumption time. In a survey conducted by the Universite Catholique de Louvain in Louvain-La-Neuve and published in June 2006, 51% of respondents from Brussels claimed to be bilingual. It should be noted that due to the growth of the city of Brussels, the periphery, which is institutionally part of Dutch-speaking Flanders, attracts an important French-speaking population. In some of the municipalities immediately bordering the Brussels Capital Region, the majority of the population has become French-speaking, in a few cases numbering over 70%. The often minimal knowledge of Dutch of some French speakers and the perceived unwillingness of some to learn Dutch, although they live in Flanders, along with the increasingly nationalistic agenda of most flemish politicians, have led to friction between the two communities. One way of quickly identifying whether you are in Brussels or in Flanders is by looking at the colors on the pilars of the traffic lights: they are red and white in Brussels, and yellow and black in Flanders. A curiosity is the "Marollien" dialect, heavily influenced by Walloon which used to be spoken mostly in a central section of the city. Today, the Brussels dialects are on the verge of extinction, although some try to revive them (see links). 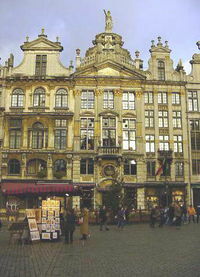 Brussels has several universities, the Université Libre de Bruxelles (ULB), the Vrije Universiteit Brussel (VUB), the Facultés Universitaires Saint Louis (FUSL), the Katholieke Universiteit Brussel (KUB) and the Royal Military Academy (RMA). A satellite campus of the Université Catholique de Louvain (UCL) is also located in Brussels: it is called "Louvain-en-Woluwe" or "UCL-Brussels", and hosts the faculty of Medicine of the university. The Koninklijk Conservatorium is a drama school in the city attended by many of the top actors and actresses to come out of Belgium. Brussels is served by Brussels National Airport, located in the nearby Flemish municipality of Zaventem, and by Brussels South Airport, located near Charleroi (Wallonia), some 80km from Brussels. 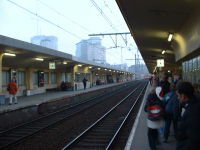 Brussels' major train stations link the city to the United Kingdom by Eurostar, and to other major European cities by high speed rail links (such as the Thalys). The Brussels metro dates back to 1976 (but underground lines known as premetro have been serviced by tramways since 1968). A comprehensive bus and tram network also covers the city. Brussels also has its own port on the Willebroek canal located in the northwest of the city. An interticketing system means that a STIB/MIVB ticket holder can use the train or long-distance buses inside the city. The commuter services operated by De Lijn, TEC and SNCB/NMBS will in the next few years be augmented by an RER rail network around Brussels. In mediaeval times Brussels stood at the intersection of routes running north-south (the modern Hoogstraat/Rue Haute) and east-west (Gentsesteenweg/Chaussée de Gand-Grasmarkt/Rue du Marché aux Herbes-Naamsestraat/Rue de Namur). The ancient pattern of streets radiating from the Grote Markt/Grand'Place in large part remains, but has been overlaid by boulevards built over the River Zenne/Senne, the city walls and the railway junction between the North and South Stations. As one expects of a capital city, Brussels is the hub of the fan of old national roads, the principal ones being clockwise the N1 (N to Breda), N2 (E to Maastricht), N3 (E to Aachen), N4 (SE to Luxembourg) N5 (S to Rheims), N6 (SW to Maubeuge), N8 (W to Koksijde) and N9 (NW to Ostend) . Usually named steenwegen/chaussées, these highways normally run straight as a die, but on occasion lose themselves in a labyrinth of narrow shopping streets. As for motorways, the town is skirted by the European route E19 (N-S) and the E40 (E-W), while the E411 leads away to the SE. Brussels has an orbital motorway, numbered R0 (R-zero) and commonly referred to as the "ring" (French: ring Dutch: grote ring). It is pear-shaped as the southern side was never built as originally conceived, owing to residents' objections. The city centre, sometimes known as "the pentagon", is surrounded by the "small ring" (Dutch: kleine ring, French: petite ceinture), a sequence of boulevards formally numbered R20. These were built upon the site of the second set of city walls following their demolition. Metro line 2 runs under much of these. On the eastern side of the city, the R21 (French: grande ceinture, no particular name in Dutch) is formed by a string of boulevards that curves round from Laken ( Laeken) to Ukkel ( Uccle). Some premetro stations (see Brussels metro) were built on that route. A little further out, a stretch numbered R22 leads from Zaventem to Sint-Job. Photograph of the fifth conference in 1927. 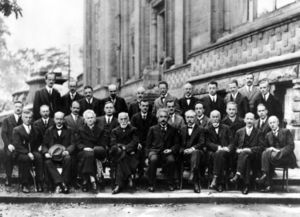 Brussels hosted the famous fifth Solvay Conference in 1927, where physicists like Albert Einstein, Planck, Curie, Lorentz, Dirac, De Broglie, Borh, Schrödinger, Pauli and Heisenberg discussed about the path of the modern physics, specifically the new Quantum Theory. Einstein, disenchanted with Heisenberg's " Uncertainty Principle", remarked "God does not play dice". Bohr replied, "Einstein, stop telling God what to do." (See Bohr-Einstein debates). Seventeen of the twenty-nine attendees were or became Nobel Prize laureates. Brussels hosted the third Congrès international d'architecture moderne(Dutch:Internationaal Congres voor Moderne Architectuur) in 1930. Two world fairs took place in Brussels, the Exposition universelle et internationale (1935) and the World Expo '58 in 1958. The Atomium, a 103 metre representation of an iron crystal was built for the Expo '58, and is still there, now renovated. Throughout 2003, Brussels celebrated native son Jacques Brel on the 25th anniversary of his death.